Thousands of workers from factories of European car giants Fiat and Renault in western Turkey were on strike Monday in a rare wage dispute to hit the flourishing Turkish car sector. The production lines in Bursa, the centre of the Turkish car industry, were not working due the industrial action for higher pay, sources from both factories told AFP. The strike began Thursday in Turkey's biggest car plant which is managed by Oyak Renault, a joint venture between Renault and the Oyak army pension fund. Over half of the 5,000 employees have joined the strike, according to management. Meanwhile, hundreds of employees of Tofas -- a joint venture between Fiat and Turkish industrial giant Koc Holding -- launched their own strike in solidarity with Renault and demanded wage rises. A Renault source said that talks were in progress with the strikers in a bid to end the dispute, but it was not clear when the plant would resume work. 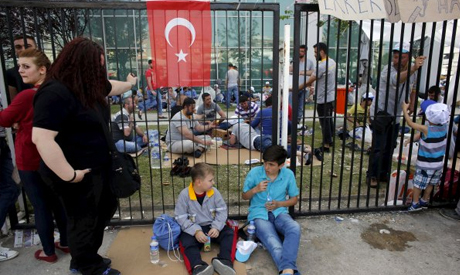 However, a spokesman for Renault in Turkey vehemently denied there were any formal negotiations with the strikers. "Contacts are in progress with the union and other constructors to put in place the necessary actions to protect the companies and the employees and return to normal work." "There is no negotiation with the strikers," he added. Hundreds of workers from a leading equipment manufacturer in the city, Coskunoz, have also been on strike since Saturday. The strike movement also spread Monday to another auto parts maker, Mako, Turkish press reports said. The strikers have been asking for wage increases in line with those seen by other industrial firms in the city, with one factory said to have offered its employees a rise of as much as 60 percent. Renault's factory in Bursa has a capacity to produce 360,000 cars a year, accounting for a large share of the country's car market, which has been one of the engines of its growth under the rule of President Recep Tayyip Erdogan. The strikes come just three weeks ahead of legislative elections on June 7, with the Turkish economy now showing signs of weakness after years of impressive growth.